It's Beginning to Look a LOT Like...SNEAKY PEEK WEEK from The Cat's Pajamas! Well, today kicks off an entire week of can't-live-without-it stampy goodness. That's what I'm talkin' 'bout--SNEAKY PEEK WEEK from The Cat's Pajamas! So turn on your Christmas tunes, sit back and take a little time each day to check out what's coming your way just a short week from now. And finally, here's what I came up with, focusing on the wintery feel and the pinks/tans/whites found in the pictures. 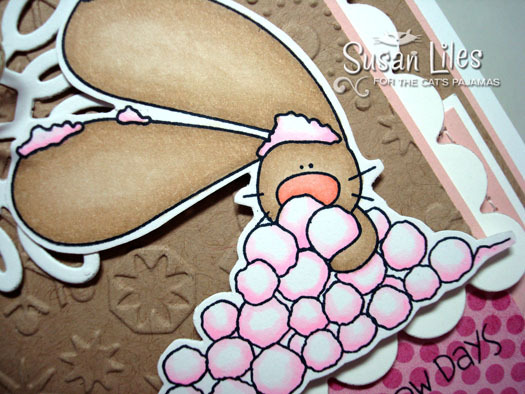 Today's SNEAKY PEEK features a set called Snow Days starring that fabulous flop-eared bunny buried in snowballs! Here he is up close, hoarding his snowballs (teehee). The Snowflake CutUps die on my card isn't new, but will surely be a must have if you don't already own it as it goes well with this entire release! Well, I'm off to take my mom to yet another doctor's appointment, shop for Thanksgiving dinner and start putting together a birthday party for Lindsie that happens this Saturday with 10 little girls, bowling and a sleepover. Is it Monday yet? Be sure and check out more inspiration and peeks by heading to Alma's blog, Dancing in Pajamas today and every day for the next week to see what else is new and FABULOUS!! I just love this card and color combo. Makes me think of iced gingerbread. YUM! Love this!! Cute image and great color combo! This is too sweet! Love the pale pink snow! This is so magnificent Susan! Love the soft browns and pinks! I just love that little snow bunny! And he is adorable in pinks! Sounds like you have a major busy week. Hope it is a blessed one, Happy Thanksgiving! oh, wow! Susan! I looove this, everything you did here....it's fabulous! So cute- love the pink!!!! What colours are the bunny? He looks great! Susan!!! This is so cute, i love this new set!! And the colours you used, hot girl!